Bison captain Justus Alleyn (#6) drives for the lay up past Victoria’s Jake Newman (#6) Jan. 13 at the Investors Group Athletic Centre. A week removed from sweeping the University of Lethbridge, the Bison basketball programs found themselves on the receiving end of a sweep this weekend. 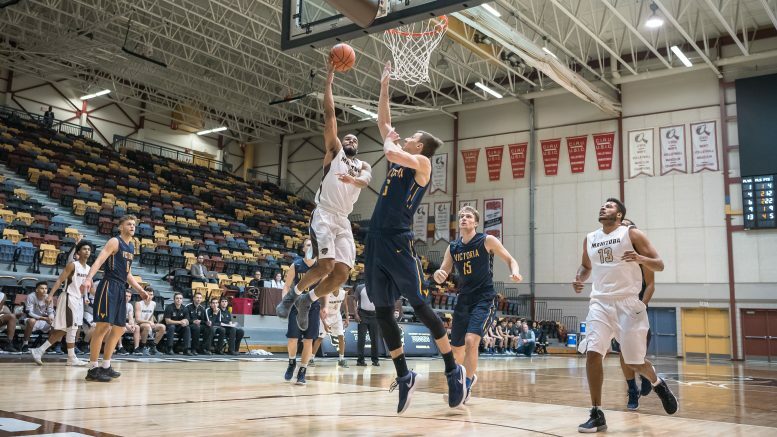 The Bison men’s basketball team lost 81-76 on Saturday and 86-76 to the University of Victoria Vikes. The women did not fare much better, falling 71-68 on Saturday and 90-78 on Sunday. In the opening game of the two-game series against the Vikes, Manitoba was dealt an early blow with starter Joey Nitychoruk being forced to leave due to injury. This forced head coach Kirby Schepp to rely on his bench, with sophomore guard James Wagner still not available. Opportunity came knocking for rookies Cameron O’Hara and Wyatt Tait. The former finished with five points and five rebounds, the latter finished with four rebounds, six points, and two steals. “We’re losing two starting forwards and I was really proud of [how] the first-year guys played,” Schepp said. The game came down to the wire and some questionable officiating calls caused a stir on the Bison bench, but the hometown herd fell by just four points. On Sunday, the Bisons were eager for a split, but unfortunately a poor final quarter allowed the Vikes to pull away with the sweep. Justus Alleyn was dominant, playing 38 minutes and scoring 35 points, two rebounds, and five assists. Victoria’s depth helped them in this game, scoring 40 points from the bench, with Manitoba only scoring 10. The Bisons are now 10-6 on the year, and sit in fifth place in the Canada West. A slow start plagued the Bisons in the opening game on Friday, with the Vikes outscoring the home side 29-13 in the opening 10 minutes. Manitoba attempted to make up for it in the third quarter by going on a ridiculous 21-2 run to go up by one heading into the fourth. Brittanie Parisien had a chance to tie the game in the dying seconds but her three-point attempt did not drop. Taylor Randall played all 40 minutes, scoring 25 points, five rebounds, and two assists. On Sunday the Bisons had a better start, finding themselves down by two after the first quarter, but the Vikes pulled away in the second quarter, up 45-37 at the half. Manitoba attempted to make the comeback but an 8-1 run in the last two minutes of the fourth stymied their chances. Manitoba’s record is back at .500 sitting at 8-8 and in eighth place in the Canada West, with the top 12 making the playoffs. The Bisons will play a home-and-home against the University of Winnipeg next weekend, with the Duckworth Challenge game going on Friday at 6 and 8 p.m. at Investors Group Athletic Centre.